After a recent trip to the local big box store I ran across Meguiar’s refreshed line of cleaning and detailing products. I’ve always been pleased with Meguiar’s products (especially their Ultimate Compound and Ultimate Polish) so decided to poke around in their selection. I needed a new one step plastic, rubber, and leather protectant so I decided to grab a bottle of their Natural Shine Interior Protectant to compare my dwindling bottle of CarPro PERL. If it worked out I would at least have another product I could pick up locally in a pinch. The price per ounce was good for a local over the counter product. I sprayed some out on a cloth and wiped it on a piece of spare trim I had laying around. It has a milky appearance, slick feel, and slightly sour chemical smell. It doesn’t smell bad per-say, just different. I’m used to CarPro PERL and Aerospace 303 Protectant smelling quite pleasant. The protectant doesn’t go on perfectly smooth like PERL. It takes a little bit of back and forth with a microfiber to get it to even out in appearance on plastic trim and panels. That said, it does dry to an even satin finish. I recently picked up a new dash vent panel from the salvage yard to install in my wife’s car. The sun and heat had deteriorated the surface of the plastic a fair bit. I figured this would be a great initial test bed for Meguiar’s Natural Shine Interior Protectant. 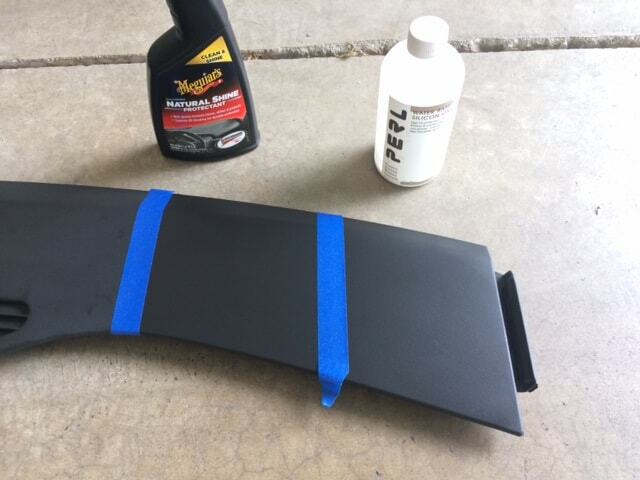 I taped off a section and first applied my tried and true CarPro PERL. 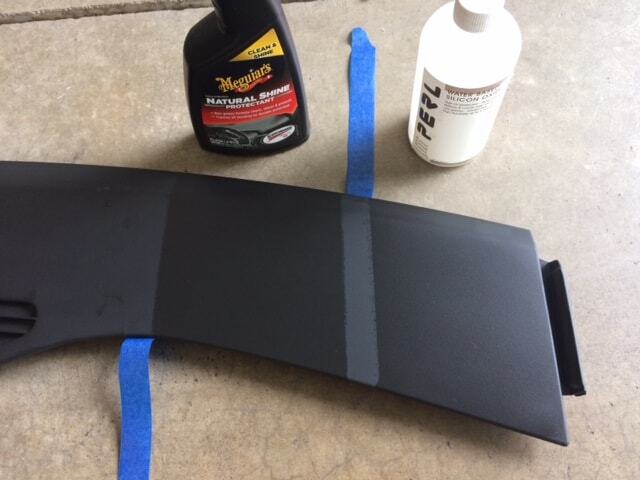 I then taped off and applied a section of Natural Shine. 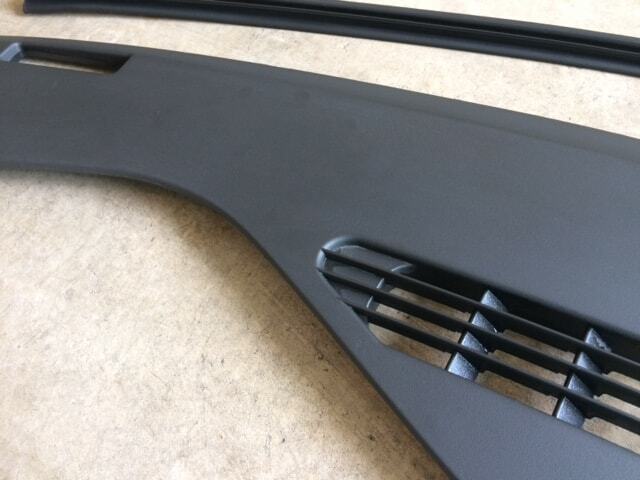 As you can see, the CarPro PERL left a more natural matte finish. It was also very easy to apply, soaking into the plastic like water into a sponge. 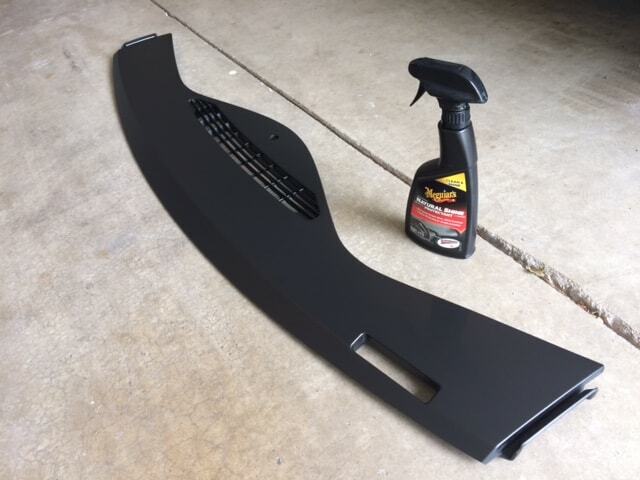 The Meguiar’s Natural Shine, on the other hand, imparted a darker and more satin finish. It took little more effort and couple applications to get an even finish but it really looks great. I decided to finish the panel off with the Meguiar’s since the look was so striking. This also gives me a chance to see how it holds up inside the car over time. Overall, I’m very pleased with the product for the price. I wanted to see how the Natural Shine compared to PERL and Lexol on leather. 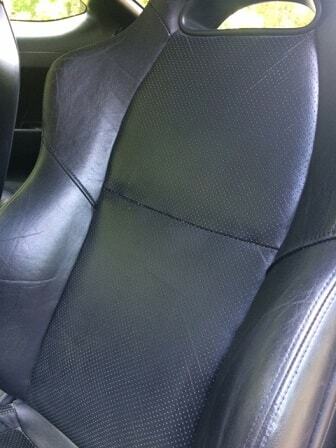 I have access to a thoroughly used and worn coated leather seat. 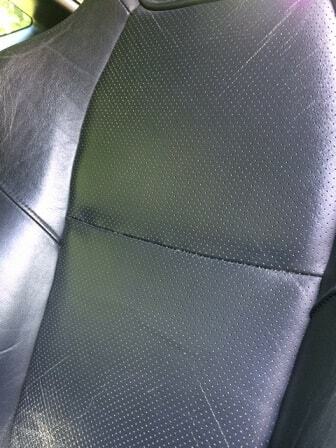 You can see in the first picture there is very visible lightening of the leather from both wear and dirt. A quick spray on a cloth and wipe of the Natural Shine and much of the discoloration in the grain of the leather was removed. You can’t see it in the picture but the Meguiar’s Natural Shine did leave behind a lightly uneven coloration, something my PERL and Lexol have not done. Opinion? Sufficient in a pinch but not a show winner. Another curiosity of mine was how well the protectant worked on rubber. I figured door seals and tires would be a good choice. I don’t have a picture of this test but I can tell you that it’s not great on tires but is sufficient for rubber trim/seals. It was extremely difficult to get an even appearance on the tires, even with several applications. From afar it looks great, but up close it’s meh. I’m not going to hold this against it, however, since it’s only advertised an interior protectant. I was just curios since CarPro PERL works great on tires as well (but doesn’t last long in the rain). I didn’t go too crazy with the testing because it’s a simple product with simple claims and a low price. I’m sufficiently happy with it that I would buy it again if I were in a pinch or was recommending an easy to find over the counter product to someone not enthusiastic about auto detailing. On plastic it’s great. It’s holding up great in the car sitting in the dash in the sun every day. On leather it’s just ok. On non tire rubber it works well as well, leaving a nice dark satin finish that doesn’t rub off. For the price, it’s a solid interior protectant and pretty hard to beat. If you’re standing in an isle right now wondering if it’s worth a shot, go for it!